A4 letter tray for offices. Economical plastic construction. Mesh design for lightness. Tray walls to keep contents inside. Use for inboxes or outboxes. Pack of 1 letter tray. Colour: Red. 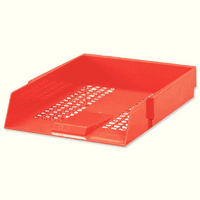 If you are buying 2+ letter trays, don't forget your risers - product code KF10059. Approx Dimensions (CM): D34 W27.5 H5.5. Approx Weight (KG):0.2481.